Most of us think of Garnet as being a blood-red gemstone that’s the birthstone for January. But did you know Garnet comes in lots of colors, ranging from pinks and purples, to oranges, browns, and vibrant greens? I didn’t either. 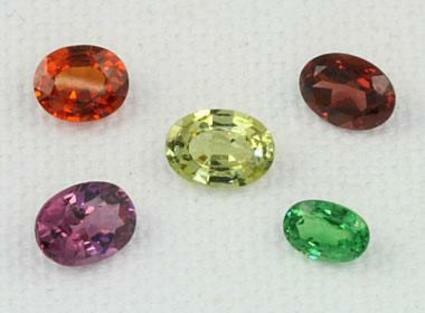 Orange, yellow, red, green, and purple African Garnets. Thanks to http://www.geology.com for this photo. Ranging around 7 on the Mohs scales of hardness (1-10), Garnet is a sturdy mineral, popular in jewelry and boasting a long history going back 5,000 years. The word “garnet” is thought to come from the uncut stone’s resemblence to pomegranate seeds. Africa is the source of the world’s largest supply of Garnets, though other sources include India, the Soviet Union, Brazil, and the U.S. Ancient Egyptians prized Garnet and included these semi-precious stones in the tombs of Pharoahs for enjoyment in their afterlife. Ancient Romans carved Garnet into signet rings. Asiatic peoples wore them for protection and used them as weapons. 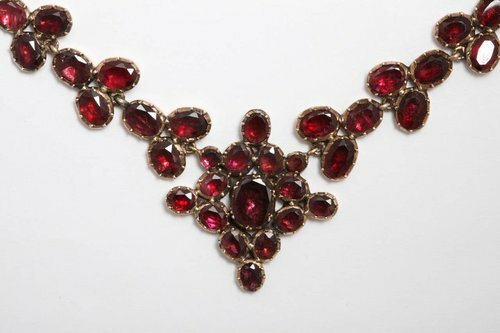 Christians and Muslims used Garnets as talismans during the Crusades. A red Garnet was included on the breastplate of the Hebrew High Priest. And it’s said that Noah used a Garnet on the ark to light its way. In addition to its uses in jewelry, Garnet has found a purpose in watch gears, scientific instruments, sandpaper, and abrasives. Garnet is traditionally given for a second wedding anniversary. Feng Shui experts see red Garnet as fire energy, which should be placed in the south area of a home or room. Garnet is associated with the base chakra, the foundation for the body’s physical and spiritual energy. An out-of-whack base chakra manifests in low energy and enthusiasm, self-doubt, and immune system disorders. Set at least three Garnets on your desk to improve your business. Put some beneath your pillow to cure depression and ward off nightmares. Boost your popularity and self-esteem by wearing Garnet jewelry. Garnets are said to provide protection on trips and bring constancy to friendships. Note: The claims here aren’t meant to take the place of medical advice. They’re based on folklore and other sources, and likely “work” best if one’s belief is strong enough! This entry was posted in Sunday's Gem and tagged garnet gemstones, healing gemstones, metaphysical healing, properties of garnet. Bookmark the permalink. I used to have a necklace of small, round garnet beads. Where did it go? I have no idea. But I do love garnet, and it’s interesting to read a bit about its history. Now that I think about it, my beads did look like pomegranate seeds! Maybe I should replace my necklace by stringing some pomegranate seeds — it certainly would be cheaper! I like garnet, but I don’t have much of it, other than a few beads. And I’m not 100 percent convinced they’re the same quality as those sparkling, professionally-cut stones. I find that red necklace to be stunning, though I’m afraid I wouldn’t have a single place to wear it, ha! No Debbie, neither did I. I always thought that Garnet came in various shades of red, so thank you for sharing that very informative fact. It’s funny because I’m not someone who particularly likes the color red, however, I do like it in a Garnet. Perhaps because it’s a “deep” shade of red. Plus, I love red wine and a Garnet resembles the color of a nice, dark Cabernet. HA! Thanks so much for sharing, my friend. I really enjoy these Sunday gemstone posts! I hadn’t thought about it, probably because I’m not a wine connoisseur, but you’re absolutely correct: those deep red garnets do look like a sparkling red wine! Good call, Ron! Glad to hear you enjoyed the post and took away some information. There are so many lovely gemstones in our world, and I never knew they had such picturesque histories and so many healing properties. I’m learning from my research, too. Kim, you know this Irish gal is a lover of ALL things green! But somehow, part of me feels they should have named the green, orange, etc. stones something other than ‘garnet.’ Nobody asked me, of course! Love the garnet stones that are garnet colored. I do too, John. Thanks for reading and commenting — your presence always makes me smile! No, I had no idea garnets came in all those colours! I’ve always loved red garnets because they look like the very best rubies… and I can’t afford the very best rubies! Indeed! I love the deep red color — those others tend to look lab-created to me. But I was surprised to learn garnets even come in colors other than red! Who knew. Thanks for enlightening me. thanks for stopping by here, Tanya — good to see you, and I hope 2018 is a good one for you and yours!